On the final day of the 5th Khoryug Conference on Environmental Protection being held in New Delhi the Gyalwang Karmapa spoke passionately about the environmental emergency facing the world, and pointed to our individual personal consumption choices as one way to make a difference. The Gyalwang Karmapa urged Mahayana Buddhists to bring environmental conservation into the very heart of their spiritual practice. He appealed to the gathered monastics to make a difference in their individual communities, and pointed out that there are simple choices we can each make to reduce our personal consumption of finite resources such as water. Turning next to the environmental emergency faced in Tibet, the Gyalwang Karmapa called on China to take responsibility for protecting Tibet’s fragile and important environment. The Gyalwang Karmapa then pointed out that traditionally the Tibetan way of life was lived in harmony with the environment. 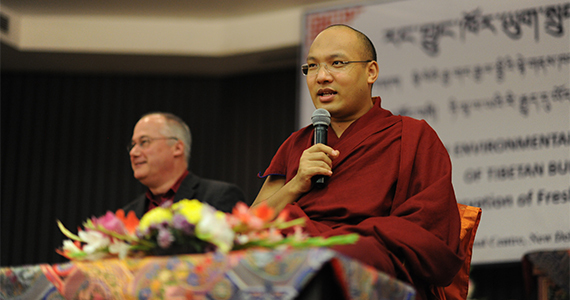 The Gyalwang Karmapa then urged India to also play a more active role in protecting Tibet’s environment. 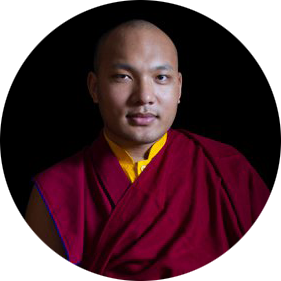 The Gyalwang Karmapa’s comments came at the conclusion of a week of training in water conservation issues for monastic representatives from 55 monasteries and nunneries across the Himalayan region. Under the umbrella of the Khoryug organization, which the Gyalwang Karmapa chairs, member monasteries and nunneries in the Himalayas actively protect their local environments through activities such as tree-planting drives, clean-ups, conservation of water resources, waste management, and education initiatives for their local communities. Tenzin Norbu, Director of the Environment and Development Desk at the Central Tibetan Administration and who was a key speaker at the conference, commended the activities of Khoryug under the Gyalwang Karmapa’s leadership. He pointed out that the organization set an example not only for other Buddhist monasteries and nunneries from all lineages across the Himalayan region, but also for non-Buddhists too.